Okay, so as it happened, Ex-hurricane Ophelia didn’t actually break my heart. It did, of course, cause a lot of damage across the country, and in some cases brought very real tragedy to at least three families. Simon and Garfunkel fans will get the reference. The rest of you are possibly too young. Or have no taste in music. You have my pity. The storm rolled in last Monday, coming in from the Atlantic. It wasn’t a typical Atlantic winter storm (like Brian, which is raging now as I type), but an actual Hurricane. This partly explains the nomenclature. And, you have to admit, Ophelia certainly grabs your attention more than Brian. Who thought Brian was a good name for a storm? Maybe someone out there knows a really angry Brian. I don’t. The Brians I know are all very nice indeed. It had to be a boy’s name beginning with B (the first storm was a girl: Storm Aileen). They could have gone with Butch, maybe. Or something biblical, like Bartholomew. Or way -out-there Norse… Beowulf, maybe. But Brian? I did wander up the Black Avenue with a torch to survey any damage. All seemed okay up there, and nothing serious to report. Powerful winds though. Probably not the wisest option, but I just needed to get out and stretch the legs after the cooped-up feeling of the day. I resisted the temptation to run with the head torch, and when I say I resisted the temptation, it would be fairer to say that S resisted the temptation to bash me about the head when I suggested the idea. On Tuesday, I discovered my Garmin watch had not fully charged due to the previous day’s shenanigans. Yes, that’s a deliberate tongue-in-cheek remark, considering some more remote parts of the country are being warned they could be without power for up to ten days. Ten days! With kids to feed, cows to milk and generally life to live. That’s a stretch. If nothing else, it is a reminder that the storm was so big (and the country relatively small) that it covered the entire island. According to Wikipedia, the Black Valley in Kerry was the last place in Ireland to get electrified. That was in 1978. I was about 11 years old. Incidentally, if you don’t know the place, it really is quite wonderful. Spin up through the Gap of Dunloe and then head back to Killarney through Moll’s Gap. Do it on a bike; even better. When you hit the valley, you will understand why it was the last place to get it. I wouldn’t be surprised to learn there are still some homesteads there without it, to be honest. View of the Liffey above the weir near Lucan, post-Ophelia. Anyway, to overcome the great calamity of not having one’s watch for a run, I took the iPhone instead, and fired up SmartRunner. It was only a short run, and I spent most of the time trying to avoid tripping over woody debris on the tracks. About 9.2k was all I could muster, though in fairness, it was a combined speed work sort of thing; a fartlek run with some weights at the end: I detoured back home via the motorway – something I would strenuously avoid like the plague. I wanted to have a peek at that Beech tree that had come down; the one in the pic above. Being something of a scavenger (I get that from my Dad), I found a piece just over the wall that was manageable, and carried it home for the last half a kilometre. For the fun of it, I weighed it. Just over 50lbs. I may try and carve a spoon or three from the timber, as it looks quite clean and fairly knot-free in places. There are other trees down too, in the area, so I will have a timber sortie, and stock up on some Sycamore, Oak and Birch. Panoramic of some of the Iveagh buildings in Dublin. I was in town for a conference on Thursday. Friday was yet another 10k recovery run, and this time I eased off and took the full hour to get around my usual loops. All told, a bit of a slog, but then it can be, sandwiched as it is between the exertions of Thursday’s tempo run, the memory of which is still very much in the legs, and the promise of even more on Saturday’s long run the next day. So. Saturday. And the last ‘long’ run before the real long run. And though it was 13k on the board, I only managed under 11, in just over the hour. Even though I was up before 8am, the longer I left the run, the worse the weather became. Storm Brian is upon us, and the few bright spots in the morning have been swallowed up in a sea of gusty greyness and a second-helping of leaf litter. You often hear people say they were wet to the skin. ‘Fliuch go craiceann’, as we might say in Irish. Well, by the time I hit the top loop of the park and was facing into the worse of the wind and rain, I truly was soaked through. I am amazed any of the electronic gadgets I had with me survived. I suspect another couple of miles and they would have begun to fail. First to go would have been the little FM radio I have in the pouch, followed by the iPhone (which I had in the running pouch I usually bring strapped around my waist, but this time I had forgotten to protect it any further). After that, maybe the station alerter, though I did have that in a little plastic bag. Last to fry would have been the Garmin, which is allegedly waterproof, but for that you can read splash-proof. This won’t mean much to those who don’t watch Coronation Street, or at least are aware of its existence… If you know the character, then this will raise a smile. If not, then you, my friend, have a heart of stone! No harm done in the end. We all survived. Showered and changed now. Four runs left. It’s the final countdown, but I used that gag before in a blog post prior to the half-ironman race in Groomsport, so I will resist the urge to burst into song. The route for the Dublin Marathon has changed a bit over the years though it seems to have settled into a familiar enough groove for now. Above is the course from 1981. Not that I was running marathons back then, of course. I was in second year in school and about 13 years old. I was a sprinter in those days. Anything over 200 metres gave me the heebie-jeebies. Above is the current course. As you can see, it has been customised for a four hour finish time, and this is really to print out for any potential spectators who will be trying to work out where I’ll be at any given time. I have started checking on the weather too; a totally pointless experience really. The weather on the day will be whatever it is on the day… that’s the way it works. It may look okay on Norwegian Weather now, but that is so subject to change in this turbulent part of the Atlantic seaboard that I may as well be using the internet to play fantasy yak racing in Mongolia. It looks okay, I admit. But the real enemy is not sun or rain, but wind. We’re unlikely to have a humidity problem at the end of October, but a strong breeze in your face will add minutes to your time, and wear you down mentally. So, when you are an anally-retentive graphic designer with a mild grammar-nazi fixation, you can’t help but get upset when you see advertising like this. I spotted the offending item when I was shopping yesterday. 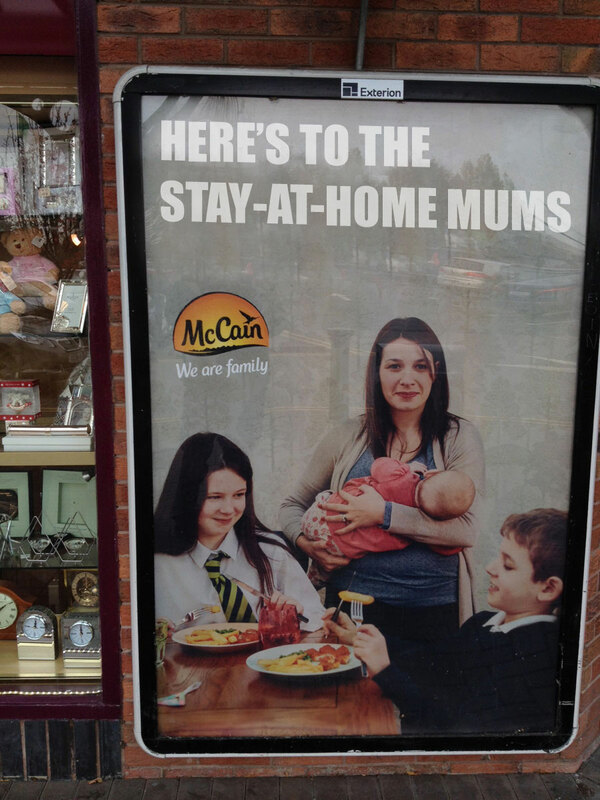 McCain’s make oven-ready chips, so the basic premise of the campaign is to try and assuage your guilt if you are feeding your family and are a little stretched for time. Add in a dollop of sexism, and the poster starts to get a little tricky. But it was the sheer appalling abuse of text placement and lack of hyphenation that made my brain flip. I couldn’t even read the ad properly at first. 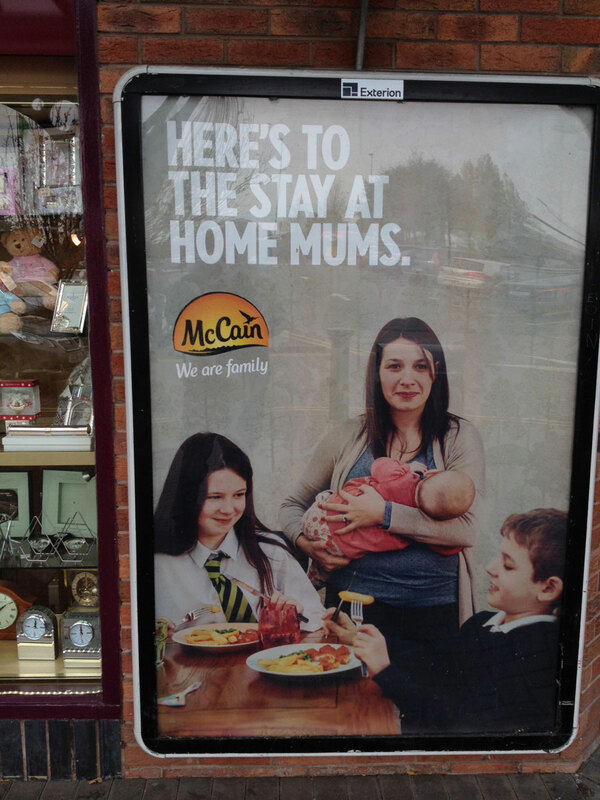 Indeed, it looks initially like McCain’s are saying to mums that they should stay at home. This is not what they are suggesting of course. But without hyphens, the proposition is ambiguous. And so to finish up, here’s a picture of Holly, patiently waiting for S to return from work. Thank you for getting in touch with us about our We are Family ad and for sharing your concerns. We are sorry if we’ve caused any offence- that certainly wasn’t our intention. Through this campaign we want to celebrate the diversity of every kind of family up and down the country. We have passed your comments to our Marketing team who always appreciate feedback. Agreed – poor punctuation is the first thing I notice but people get very upset if you correct them! People need to up their game!